Hiring? 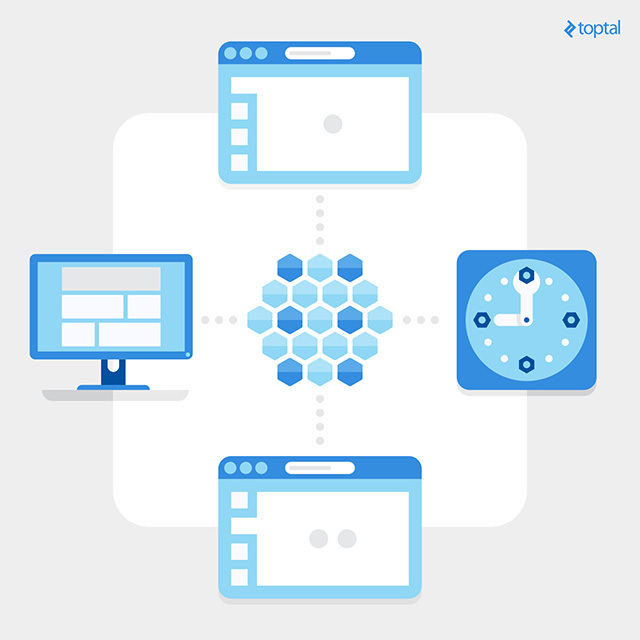 Toptal handpicks top Ruby engineers to suit your needs. Microservices are one of the latest trends in software design where multiple independent services communicate among themselves and have their own processes and resources. This approach differs from a typical client-server application design. The usual client-server application consists of one or more clients, a monolithic back-end which includes all domain data and logic, and an API which allows clients to access the back-end and its functionality. In a microservices architecture, the described monolithic backend is instead substituted by a suite of distributed services. This design allows better separation of responsibilities, easier maintenance, greater flexibility in the choice of technologies for each service, and easier scalability and fault tolerance. At the same time, complex distributed systems have their set of challenges. They have a greater chance of having to deal with race conditions, and they are harder to debug as problems are not easily pinpointed to one single service, but are instead distributed through many. If an effort is not made to follow the best practices while building such a system, you may find yourself surrounded by fires that you do not know how to put out. Special care must be taken with the services’ payload contracts, as changes in one service may affect all its clients, and consequently all the back-end’s service suite. All these considerations are important, but let’s assume you have already thought them over. Now what you want is to find a way to build a microservices back-end on your own. So let’s dive right into that. 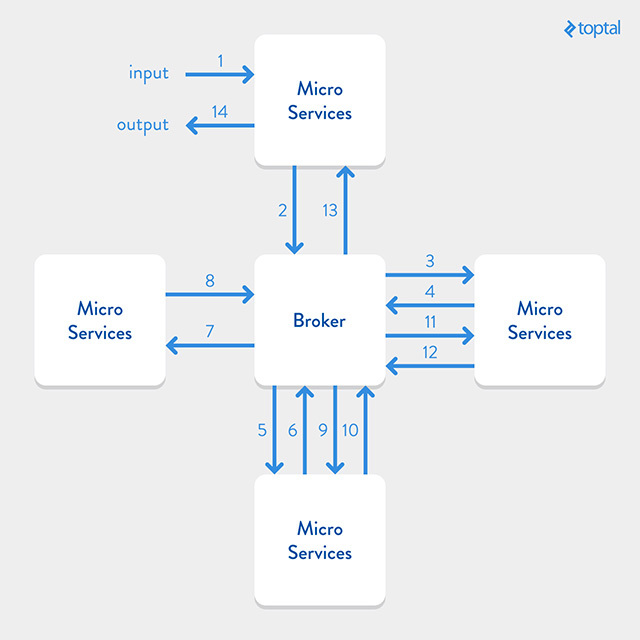 There are currently many ways you can set up your microservices, and in this guide we will focus on a broker architecture. A broker architecture is one of the ways you can get your services to communicate amongst themselves. In it, all services surround a messaging server, the broker, and all are connected to it. Services send messages to the broker, who then knows which other service or services he needs to forward these messages. This way, services do not need to keep information about other services. Instead, they rely on the broker to take care of all the messaging, and it allows them to be isolated and focused only on their particular domain. A broker may also store messages when their receivers are down, allowing senders and receivers to not be forced to be up simultaneously, thus allowing for even greater isolation. Of course, there are drawbacks to this solution as the broker can quickly become a bottleneck since all the communication must go through them, and it can also become a single point of failure for your backend. However, there are a few ways to mitigate these problems. One way is to have multiple instances of the broker running in parallel, which would allow better system fault tolerance. Another way would be using other architectures. Alternative architectures differ from the architecture we will implement in this guide by not using a broker, or by using a different broker architecture, or by using a different messaging protocol such as HTTP. In this guide, we will be using ZeroMQ to handle the communication between the services and the broker. 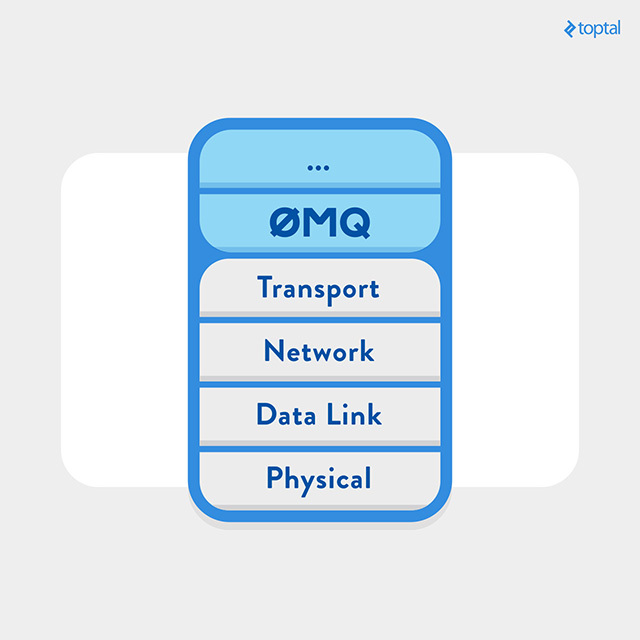 ZeroMQ provides a protocol abstraction layer which handles multipart asynchronous messages over random transports. The advantages of using ZeroMQ for messaging between services and broker are outside the scope of this guide, so we won’t go over them right here, but if you want to know more about them, check out following Quora article. If you are interested in finding out other ways to get your services talking to each other, I suggest you take a look at Broker vs. Brokerless article to see what else can be achieved. This article will guide you through all the steps needed to create your microservices suite. Our system will consist of a broker and a service. We will also be using a small client script to test calls to the service suite, but keep in mind that the client code can easily be used anywhere. First, let’s make sure you have everything you need to run the broker and the service. First, begin by downloading and installing Node.js, ZeroMQ and Git on your machine. If you are using OSX, there are homebrew packages for each of them, and most Linux distributions have a package for each of them too, so you should have no problem with this. Windows users can simply use the download links provided above. After installing all the required dependencies, let’s get our broker running. In this guide, we are using a Node.js implementation of the broker which is a part of the ZMQ Service Oriented Suite. You can find its code and documentation on GitHub. To run the broker, first clone a Broker bootstrap to your machine. This repository is a bootstrap for using the broker library above. Note, this step is not required as the original library is itself runnable, but the difference between the two is that in the bootstrap repository you can change the default configurations. The backend parameter defines the ip:port address of the broker’s back-end and front-end. The back-end address is where the broker receives requests from and replies to the services, and the front-end address is where it receives and sends to the service clients. You can also set the logging level by changing the log.consolePlugin.level. Possible values are trace, debug, info, warn and error`, and they determine the amount of logging information broker process will output. After you have your broker up, it is time to develop your first Ruby microservice. Start by opening a new console window. Then, create a directory where your services will be stored and then go to that directory. In this guide, we are using the Ruby client and service of ZMQ SOA Suite. There is a bootstrap “Hello world” service available, so let’s use it to get our first microservice running. Great. You have your first service up and running. 2015-12-15 16:45:14 | INFO | SMI - SMI register for sid: HELLO-WORD instance: hello-word#aaa65374-8585-410a-a41d-c8a5b024553b! This log means the broker has acknowledged the existence of a new service and is receiving heartbeat messages from it. Every second, the service sends a heartbeat message to the broker, so it knows the instance of the service is up. So now we have a service running, how do we use it? Good. You have just launched and consumed your “Hello World” microservice. This is not, however, what we set out to do. We want to build our service(s). Let’s get to it, then. First, let’s stop our “Hello World” service. Go to the service’s console window and press Ctrl+C to stop the service. Next we need to turn our “Hello World” service into the “Person” service. The bin directory is where you store the scripts that launch your service. 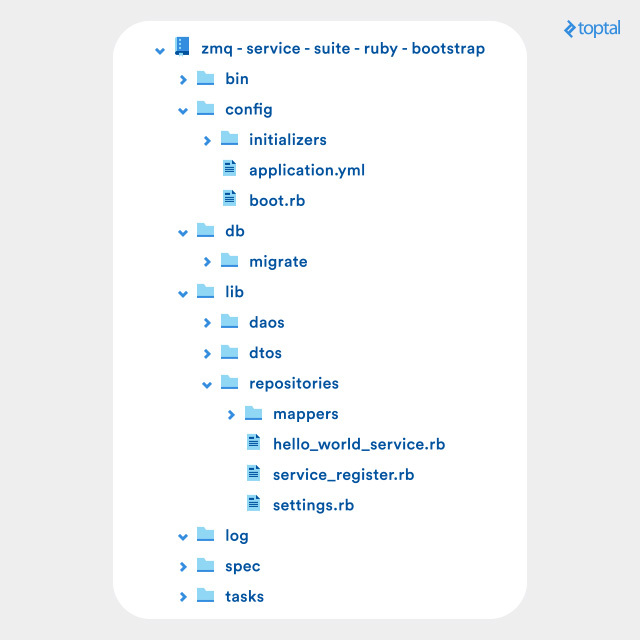 The config directory stores all the configuration files. The boot.rb file is where you can add all your service dependencies. If you open it, you can notice there are many dependencies already listed there. If you need to add any more, this is where you should do it. The application.yml file stores all your application settings. We will take a look at this file later. In config/initializers directory you can add your initializer scripts. You can, for example, add settings for ActiveRecord or Redis connections here. The scripts you add to this directory will run on the service startup. In the db/migrate directory you can store your ActiveRecord or Sequel migrations if you have any. In case you do not, you can delete this directory altogether. The lib directory is where your main application code resides. The settings.rb file simply loads the application.yml file and makes it available throughout the scope of the service, so that you can access your configurations anywhere. For instance, Settings.broker.backend returns the broker backend address you defined in the YML file above. File service_register.rb is where you register your services and service routes. We will explain it later. The hello_world_service.rb file defines the “Hello World” service’s endpoints. The lib/daos directory is where you store your ActiveModel objects if you are using ActiveRecord, or any other data access objects you might eventually create, such as your Sequel models. The lib/dtos directory stores your data transfer objects. These objects are the ones that are eventually sent back to the service’s clients. The lib/repositories directory stores your repositories. Repositories are objects that allow services to access data and are the only objects allowed to handle DAOs. So if a service wants a group of “Hello World” instances, it will ask the repository for them. 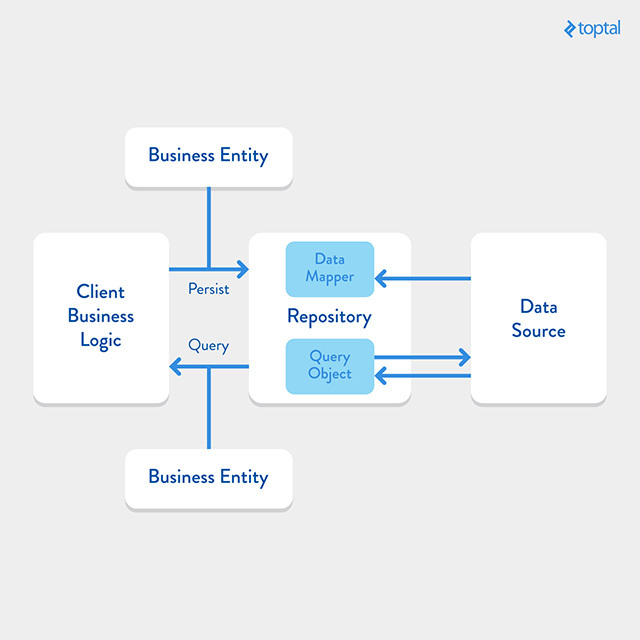 The repository, in turn, uses the appropriate DAOs to fetch the relevant data from the database. The data is then mapped into a suitable “HelloWorld” DTO or “HelloWorld” DTO collection which is returned to the service. The lib/repositories/mappers directory is where you store your mappers. Mappers are objects that convert DAOs into DTOs, and vice-versa. This setting simply sets the broker’s back-end and front-end address, and logging level. If all this sounds confusing so far, do not worry as it will become clearer as we move on. If you prefer another database, you have to add the appropriate gem to the gemfile and then bundle install the project. Here, Mapper::Base requires you to implement self.to_dao and self.to_dto. If you do not wish to do so, you can implement self.map instead and override the Mapper::Base.map which calls to_dao or to_dto, depending on whether the attribute it receives is a DAO or a DTO. Now you have a DAO to access your database, a DTO to send it to the client, and a Mapper to convert one into the other. You can now use these three classes within a repository to create the logic that enables you to get persons from the database and return a corresponding collection of DTOs. The “Person” service initializes the repository in its initializer. All public instance methods of the “Person” service have payload and headers which you can omit if you do not need them. Both are Hashie::Mash instances and they store the variables sent to the endpoint, either as attributes or headers, and their replies mimic HTTP responses as each response has a status code which clients can use to find out the result of requests sent to the service, along with the service’s response payload. Response codes are the same as you’d expect from an HTTP server. For example, a successful request will return a 200 status code, along with the response payload. If some service error occurs, then the status code will be 500, and if there is something wrong with the parameters sent to the server, the status code will be 400. The service can reply with most HTTP status codes along with its payload. So, if for example you want your service to tell its clients when they are not allowed to access a certain endpoint, you can do so by responding with a 403 code. You can see another example of response codes if you look back at our service code above. In the get endpoint, we are returning status code 404 along with the optional “No people here” message when no people are found, just like an HTTP server would return a 404 if there are no resources available. If the repository does indeed return people, then the service serializes the DTOs and returns them to the client. Each DTO has a default serializer that returns a JSON object with the keys and corresponding values defined as either attr_reader or attr_accessible in the DTO definition. You can, of course, override the serializer by defining your serialize method in your DTO classes. As you probably noticed, there is a small change in the add_route call. We removed the string “HELLO/WORLD”. That is because the string is only needed if the service verb does not match the method that implements it. In our case, when calling the person service with the GET verb, the method to be called is get, so we can omit the string. Finally, it must return the service instance. As you can see, you have caught a ZSS::Error. This is because we raise an error when no people are found by the service and we have no people yet in our service’s database. Now, run your client again. Going through the code provided in this guide, you might think there are lots of steps that were unnecessary, such as creating repositories or DTOs, and you’d be right. All you would need to have a functioning “Person” service would be your service class and your DAO, which you could call directly from the service class. Nevertheless, it is good practice to follow the pattern described in this article, as it allows you to keep service logic separated from your data storage manipulation. Services should only be focused on their logic, and repositories should handle all interactions with your data storage. DTOs determine your services’ payloads and serialization, and DAOs are only concerned with getting data from storage. The conventions and techniques described in this guide are known as the repository pattern, which you can check out in the image below. I’d like to finish by asking anyone who found this useful to contribute to the SOA service suite, by expanding and enhancing it in any way. All your forks and pull requests are welcome. I hope this will help you get started in microservices. If you want to check out the service code, a complete version is available on GitHub. It reminds me of wamp protocol that uses http instead. How do you compare the two ? Interesting article. 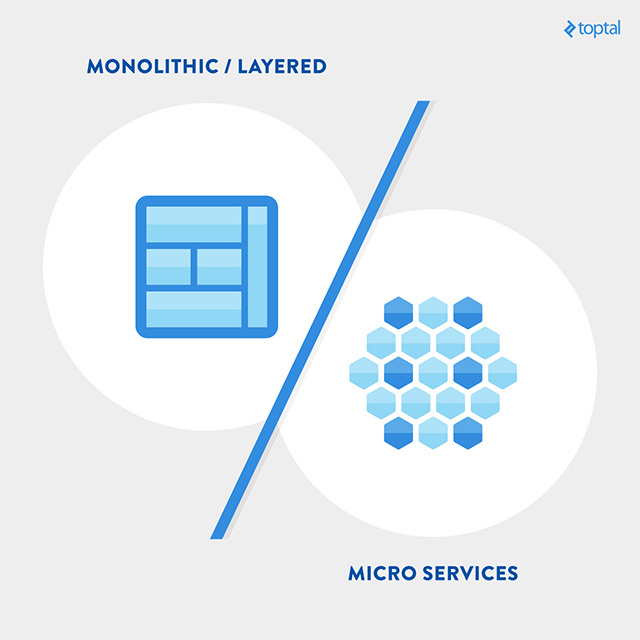 It get my attention to microservice architectures. Now I have try to figure how can we use it in financial CRM system. Hi Francisco, Sorry for my late reply. There is something particular about WAMP which is based on WebSocket, HTTP is only done for the first request and then it switches to WebSocket with much reduced overhead (http://www.websocket.org/quantum.html). Also, from security perspective I can use standard certificates for HTTPS and even certificate-based authentication. For now, WebSocket is really the defacto standard for IOT as I have seen it and I pretty curious on how to compare it with ZeroMQ. WAMP adds that RPC and events publishing stuff on top of WebSocket. Needless to say, this is about client/server interaction but I am seeing it in your example this is more about micro service. Really curious about a further comparison. Thanks again about this great article. Say you're a senior developer for a startup... they run a huge monolithic app, but they're making lots of money and want to put 2M usd in IT to make the product better/nicer/attractive.... There are tons of ideas floating..., out them all you want to embrace microservices, how do you sell it ??? I'm at that point, I know how good it is, because my other clients use it, but this particular CEO does not give a Sh*** about what happens under the hood. Shouldn't be "personInstance" renamed as "person_instance"? I would give him a couple ideas on what to expect when you work with a monolithic app. I would show him how hard it's going to be to actually make a change to your app down the road. It can become quite complicated and expensive for testing and development. Check out some of the Netflix talks on Youtube. They talk about their recent changes and improvements and the apply micorservices in almost all cases. Does my webapp wait for the broker to respond? Or broker is my webapp here, And considering this is asynchronous do I need to send response in a callback to the browser client? I have not gone throught the git repos yet.